Last week we had the very emo Black Eyed Kids which are apparently terrorizing the suburbs of America. Today we hear about a much more flamboyant breed of paranormal beings with seemingly more benign powers of influence. The Glow Men of Chile. According to Albert Urquiza, a holistic healer, he ran into one of the Glow Men while on the way to meet a client. He described them as being tall, fair skinned and clad in phosphorescent clothing. Urquiza says the pair then vanished. Unmentioned is what powers the Glow Man invested him with. If you guys were to guess, what would it be? The ability to tell that story and then charge money for this ‘quantum healing’? The ability to convince sick people that you have healed them using irrelevant science terminology. And the ability to get laundry whites whiter and colours brighter. It’s nice to know that supernatural beings approve of faith healing scams. It kind of gives them some character – bad character being better than no character at all. Usually they are just complaining about our environmental issues. Worse than Al Gore. 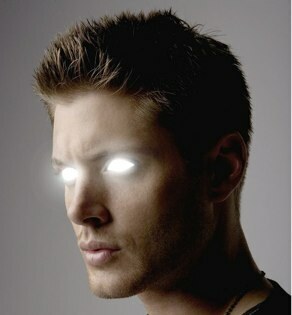 I like that you chose a picture of Jensen Ackles from the show Supernatural…It just made my day!